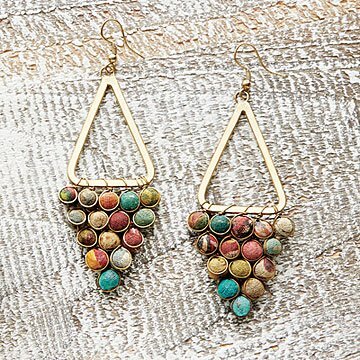 These geometric earrings are made from wooden beads hand-wrapped in recycled saris. Why settle for just a pop of color when you can have the entire rainbow? These geometric earrings are made from wooden beads hand-wrapped in Kantha textiles, a traditional South Asian embroidery technique used to make saris. The beads dangle from a gold triangle, and the design is finished with French earring wire. Because it is their unique prints that make saris beautiful, earring colors and patterns will vary. Handmade by women artisans in India who receive training, education, and fair wages. Lovely earrings, a bit heavy on my earlobes. These earrings are gorgeous & they're fair trade! They're great but they're heavy on my earlobes so I have to take them out after a few hours. These are perfect for either a casual outfit or a dressy occasion! They match so many things with the deep colors in the beads. The earrings are a beautiful color, with a great feel and weight. My wife loves that they come from India where women are growing and developing their independence through business. Because of the multi colors, I wear them with so many outfits and they are perfect. A gift that is unique.